When a once leading—now last place —smartphone maker dumps Windows Mobile and goes Android, it's an all or nothing decision. Who knew that this could save the company? The Motorola Cliq is the Android OS on Motorola hardware. Like Palm before it, Motorola decided that Windows Mobile 6.5/7 would be too little, too late to combat the iPhone menace. But instead of going in house and creating something from scratch, Motorola decided to take an already stable OS and build social networking features directly into the interface. So yes, it's basically an Android phone; but it's an Android phone++. Motorola's Cliq delivers on its social networking promise quite admirably, even if there are a few design quirks that prevent the experience from being perfect. And although it's a little sluggish on the hardware side—as sluggish as any of the other Android phones out there now, that is—the fact that it has a good physical keyboard and solid Motorola hardware behind it makes the Cliq a very interesting contender in the Android world. Moto is no stranger to building its own phones, so you'd expect some smart hardware know-how to go into Cliq's design. That's only kinda true. Everything on the phone is where you'd expect it to be and buttons are more-or-less in acceptable locations, but there's a looseness in the slide-out keyboard that's more irritating the more I play with it. I can't tell if it's because the slider doesn't quite lock into place like it should—there's a little give in both the open and closed positions—but the "Oreo-ing" is really distracting. It's not as if the screen portion will pop off, it's just an annoying looseness in the phone that makes you feel like they didn't quite solve the puzzle of fitting everything in place. A hardware keyboard is always a welcome thing to have, and the Cliq's behaves well. There's enough spacing in each of the keys that it's easy to type, but not too much that it's occupying a lot of space. There could have been some better arrangement of symbol keys (the underscore is buried under a symbols menu), but that's just being nitpicky. Overall, it's a solid keyboard that's quick to enter data with. The wobbliness of the slider means that you need to grip only the bottom (keyboard) part of the phone when you're taking a photo, or else the screen will slide open and you'll probably drop your phone. 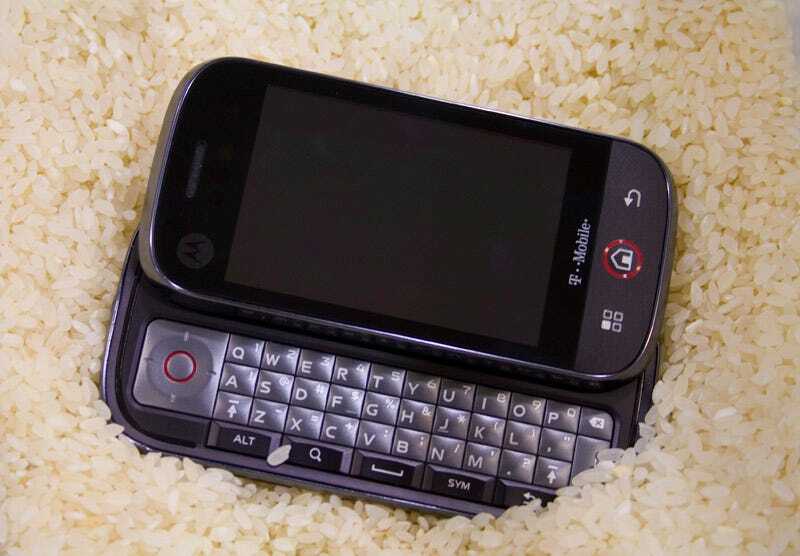 Also, Motorola decided to make the power switch flush with the right side of the phone so even Daredevil would have a hard time finding it by touch. Since the power button also lets you toggle Wi-Fi, Bluetooth, airplane mode and GPS, that's a bad design. You have to open up the battery cover to shove an up-to 32GB microSD card in there, but since you'll rarely replace that (use a microUSB to transfer files), it's not a huge deal. I do like the fact that there's no cover on the microSD slot, as well as the presence of the now-obligatory vibrate toggle on the left side of the phone. Its 3.5mm headphone jack being located directly on the top of the phone kinda screws up the lines a bit, but I'd rather a slightly uglier phone than not having a 3.5mm jack. Because the Cliq runs the same processor as the current Android phones now—like the Hero and the MyTouch 3G—there's not a whole lot of performance difference between the devices. They're all kinda slow. Not unusably slow, but transitions and animations don't pop immediately. And this sluggishness might be part of the reason why interacting with the touchscreen isn't as fluid a process as it could be, and why sometimes when you're swiping between emails or tweets, the page will pop back into place and you have to swipe a second time. As for the battery life, you can pretty much imagine how much use you'll get out of an always-connected device that gets pushed emails, tweets and Facebook updates all day. Even if you don't make a lot of calls, you'll have to charge the device every night. And if you do do a lot of texting and emailing and calling and tweeting, you'd better get an external charger. The main drain seems to be both the push and the fact that you're using the phone a lot to keep up with everything that's happening on your social networks. Motorola built a double-edged sword on that one; people want to use it a lot for checking status updates, but in turn the 1420 mAh battery runs out in less than a day. There are a couple nice touches that we're appreciative of, such as the blinking light on the front for notifications, which has been on BlackBerries for a while. Great if you don't get a lot of emails or if you don't follow a lot of people. You can also wake up the phone using the facebuttons, not just the power toggle, so two quick menu button presses will get you to the home screen immediately. Having a D pad is going to be useful in the future when Android developers start making games that take advantage of it, but you can use it now in NES/SNES emulators. And the camera is a beefy 5-megapixel autofocus, which produces decent photos compared to other Android phones. Plus, call quality is pretty good, something Motorola has managed to do well even when their software has faltered. Seeing as Android has been available for more than a while, and everyone should be familiar with what it does, I'm going to focus on the Cliq-specific sections. Suffice it to say that it can do everything other Android phones can, including downloading OTA Amazon MP3s and accessing all the apps in the Marketplace. The most important of Motorola's additions are the home screen widgets, so we'll start there. The four widgets of note are the status widget, the messaging widget, the happenings widget and the news/RSS widget. The news widget is self-explanatory, and really cool that a phone would have a built-in RSS reader right on the home screen, but the others are a little bit trickier. The status widget lets you update your "status" to any of your social networking sites, like Facebook or Twitter. The messages widget consolidates ALL your 1:1 messaging, like emails, SMS, DMs on Twitter or private messages on Facebook. The happenings is a feed of other people's status updates on your social networks. I don't know why, but it's very satisfying to be able to swipe through your emails directly from the home screen, quickly deleting or replying with just one tap. The problem comes from the way it's implemented and the lack of screen space, because you can't see the recipients list to see if you're the only person address to in an email, nor can you do a reply all if there are multiple people. And it doesn't tell you if you have an attachment. Basically it's just a small window to your email, and you'll have to actually open up the traditional email app to do any communication beyond the basics. And there's also a full-blown Messaging APP, which consolidates all your accounts like the widget does. This is where your all your social networks are rolled into one big feed. Again, it's a time saver to have all these updates in one place and being able to swipe through them, though sometimes you get way too many updates to realistically do so. What we would like is if there was an option to customize which networks displayed in the widget, so we could, say, have only Twitter and leave out Facebook. Right now it's an all or nothing affair, and you have to go into the Happenings app to see everything in list form and to be able to view only one network at a time. The widget does allow you to directly interact and respond to people's updates, so you can comment on people's walls or do an @reply to someone's tweet. All you have to do is start typing in a particular section and some menu option will pop up, prompting you with context-specific actions you can do. The RSS widget behaves pretty much the same way as the previous two, allowing you to swipe through news items like you would in a standard RSS reader. Motorola was kind enough to bundle a few types of RSS feeds together, and Gizmodo is part of the Technology one. Good choice dudes. By avoiding the creation of an entire operation system from scratch, the Motorola engineers had time on their hands to really think about the user experience, and it definitely shows in all these small touches and shortcuts they put in. • There's a five panel home screen. Eh? Ehh?? • The call button got moved to a soft button, eliminating the need for two hard buttons on the outside of the phone. You also get a contacts button instead of a end call button, since you don't need to hang up if you're not in a call. The software's not flawless, however, and you will run into some minor annoyances even with all the niceties. You don't get a lot of fine-grained control over accounts. (Yes, I made you wait this long for a pun on the top photo.) For example, you can't tell your phone to only pull down contacts from Gmail and not Facebook, or choose to display only your Twitter and MySpace contacts at once. It's basically all or just one. More account customizability would be the number one software target we'd ask Motorola's team to aim for, and something we're eager to see in Blur version 1.5. Like we said in the hardware section, the major thing holding back the Cliq from being a fantastic phone is the processor. The animations are smooth, the UI touches are smart and the social networking stuff is useful; we just wish we could have a bit more account customization, do all of that on faster hardware. Once Motorola gets the Blur platform onto a more powerful phone and works through some of the software quirks we noticed, they're going to have a really good Android phone on their hands.